This tool is for all of you who download lots of walls and floors, but don't want to click on every file individually. Next, extract the program to your desktop and run it. Next, click on the small button with 3 dots on it (...) to select your Sims 2 downloads folder. Select a file already in downloads. This will check the box. 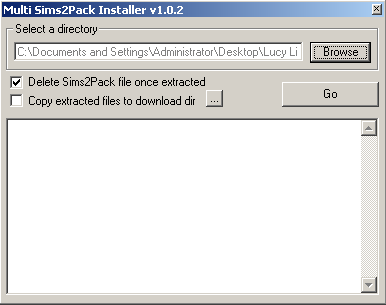 If you want to delete the sims2pack files to save space, select the option as appropriate.